Austco Polar Cold Storage have site-wide coverage with their radio frequency devices and an assortment of different scanning devices and engines. 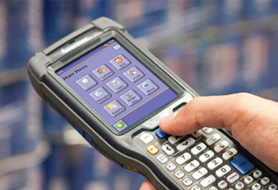 Any barcode we are provided is scannable if it follows an industry standard. Sastek16 and EAN128 are the most common standards and we have always handled these barcodes; however we also have the ability to decode and use various other standards that are used in the European and Eastern industries. Our IT department are very well versed in scanning technologies and industry warehouse practices and can provide the solutions you need.